Each morning, a high schooler at North Yarmouth Academy rises early enough to see the stars above him on a clear day. One might think — as one would of any typical high schooler — that he’s only up so early to catch up on overdue homework or because he wants time to watch television before school starts. But think again: this high schooler is not typical. He is Forecaster Jack. He is Jack Sillin, a sophomore at the Yarmouth-based private school and the brains behind the forecasting blog, forecasterjack.com, which services all of New England. He is a self-taught forecaster, and has already been featured on the Weather Channel and WCSH6 as well as in a larger newspaper in Portland. Additionally, he is an integral part of amateur forecasting agencies, such as Western Maine Weather in Florence, Maine. “I have access to all of the same data as the big-shot meteorologists,” Jack said. In forming a fore- cast, meteorologists take special notice of regional tempera- tures, patterns of high and low pres- sure systems, and the pressure of the atmosphere on any given day. 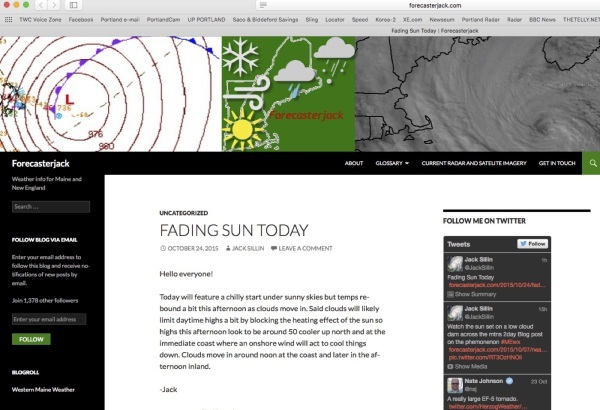 Sillin syn- thesizes all of this information himself, and every morning, far before the sun has even began to rise, he posts his forecast on his blog for any New Englander’s use. Jack started forecasterjack.com in October 2011, and as of a couple years ago, he has been making daily predictions and posting occasional lessons on his website. However, Sillin’s passion for weather started well before his website went live. Sillin wakes as early as 5 a.m. to make his predictions every morning before school, and spends an additional two to three hours each day learning more about his craft. “If it’s 75 and sunny, I’m not really gonna devote three hours to guring out 75 and sunny,” Jack said. “But if it’s a big storm — that’s where I really rack up the hours, guring everything out,” emphasising that there is no other way that he’d rather spend his time. In his pursuit of meteorology, there are a few experiences that Jack expects to stay with him as he pursues the eld further. The most recent was Hurricane Sandy, in 2012: a category three hurricane at its peak that tore up huge sections of many Atlantic islands and the East Coast. To a meteorologist, hurricanes are the jackpot, the créme de la créme of natural disasters from a scienti c standpoint: they are some of the most exciting and most powerful storms on record. When Hurricane Sandy was downgraded to a tropical storm as it approached Maine, when Jack was still in middle school, he felt con icted. The meteorologist inside of him wanted to experience the brunt of the storm rst-hand, yet he realised that the destruction the storm in icted on other parts of the country was a tragedy for many families. As the months grow colder here in Maine, there has been an increasing amount of chatter about the severity of the upcoming Winter season. The Old Farmer’s Almanac — a source loathed by meteorologists, being based more on folklore than on observational science — has predicted a severely cold and snowy Winter in New England. This contrasts sharply with many climatologists’ predictions, who generally predict a more mild winter, partly due to the El Niño cycle which the world is experiencing. The El Niño and La Niña cycles have to do with the temperature of a speci c part of the Paci c Ocean, which has been observed to have distinct effects on climates throughout the globe. “The Farmer’s Almanac is not based on science, and it shouldn’t really be trusted,” Sillin said. “The science of long-term forecasting is very new — we can’t predict sunny, cloudy, snowy, or rainy with any accuracy beyond seven days,” but he emphasised that we should trust those who have devoted their lives to these predictions. In between cross-country running, hiking, and yes — high school classes — Jack looks forward to expanding on his initial success in forecasting. This year, Jack has created another digital medium for his forecasts, delivered by video daily to anyone who adds his username on Snapchat. 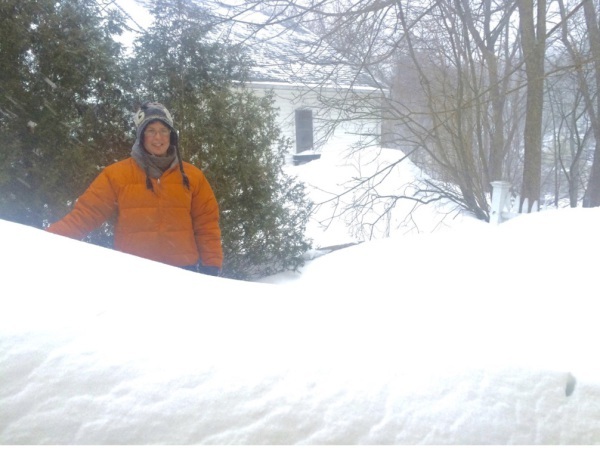 Additionally, he intends to continue another project he started last year for North Yarmouth Academy classmates, which is to keep his school constantly posted on the chance of a snow day if there is an impending storm. To see Jack’s impressive work for yourself, click the Forecaster Jack link on our website, www.upportland.com. For Snapchat users, you can add @ wxguysillin for a daily weather update to your phone that is more accu- rate than some professional meteorologists. Additionally, watch for Jack’s weather column in future issues of Up Portland as well as his daily forecast, starting in December on our web page so you can say, “I read him before he was famous!”.